Chocolate and Fruit, What is not to love? Today I had some fruit laying around and I had some Enjoy Life chocolate laying around so I figured I’d combine the two. This is an allergy free dessert with no dairy, no soy, no egg, no nuts, no wheat, no gluten and can be made with no corn! First I sliced up some strawberries and bananas and then I went searching in the pantry for some other little snacks that would compliment the two. I came up with Sunbutter for the bananas and marshmallows for the strawberries. I placed them on top of each other on some waxed paper like in the picture. Then I melted Enjoy Life chocolate in the microwave on 20 second intervals while stirring in between. 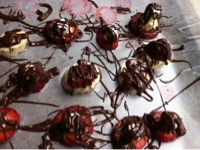 Then I just drizzled the chocolate over the fruit. 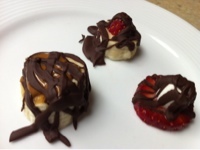 (I prefer drizzled chocolate over dipping because too much chocolate ruins the taste of the sweet fruit). 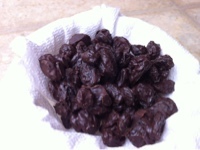 I had just a little bit of chocolate leftover so I dumped a cup of raisins in the bowl and mixed it up and spread that out on the waxed paper too. Yum!